Sean does laundry on Sunday, so we generally stick close to home. I went over to the garage top early in the morning. While I didn’t get any pictures of Hercules and Max today, I did see something funny. I didn’t see either bird when I arrived. Scanning the sky, I saw a gull fly into view, lazily cruising south. Out of nowhere, one of the falcons dove towards the gull. I thought for sure that a grim end and the gull were about to meet, so I steeled myself, not sure how that would go. The falcon hit the gull, but just on the very end of the gull’s wing. This threw the gull off balance for a second, but it quickly righted itself and stubbornly continued south. The falcon hit the gull’s wing tip maybe five or six more times as the gull traced its way south. Each time, the gull wobbled in flight, righted itself and then kept flying south. Finally, the falcon turned and flew north, leaving the gull to go about its day. Bored? Mary told me a similar story a few days ago. She was watching a juvenile peregrine stretching his wings down by the Indiana Dunes. A big heron flew by and the peregrine did a similar thing, hitting the heron’s wing tip which made the heron flip and roll in the air before it righted itself again. Most animals play and Mary said this was probably a falcon’s version of play. This is as good a time as any to mention the prey-predator relationship. Anyone who knows me knows that I am extraordinarily sensitive to animal death. Seriously, I can hardly even watch nature shows anymore. How, then, can I sit here, day after day, and watch Hercules and Max hunt right in front of me? Well, sometimes it is hard. I think all birds (yes, including pigeons) are beautiful and interesting, so I of course feel a pang when I see that the falcons have killed one, especially if they do so right in front of me. However, I’ve sort of surprised myself with this project. For one, Hercules and Max are highly efficient killing machines. I’ve hardly ever seen one of them come back with anything but a dead bird. The few times I’ve seen them with a half-alive bird, they’ve landed and dispatched it very, very quickly. So, it helps that they kill quickly so there is no suffering. For two, unless I sprouted wings, I couldn’t do anything about it anyway. What am I going to do? Yell a warning to the other bird? And then, Hercules, Max and the chicks would slowly and brutally starve to death. Nature is tough to watch sometimes and honestly, if it were another type of predator, like maybe wolves, which kill quite a lot less swiftly sometimes, I probably wouldn’t sign on for the observation job. After this odd gull harrying sequence, the falcon landed on the skyperch, puffed up and settled in for a nap. I packed up and headed on home. When I got there, I thought I’d turn the Evanston webcam on while I did some work on the computer. Evanston is the first town on the northern border of Chicago’s city limits. This pair nests on the library. 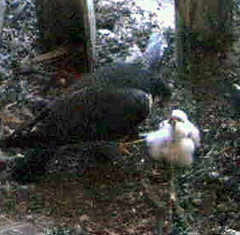 Although these pictures are grainy, it’s at least a picture of a nest area and babies. It’ll have to stand in for Hercules and Max’s nest and babies since theirs is inaccessible and not visible from any angle. ~ by Steph on May 21, 2006.